There's little doubt in my mind that prison dramas are a genre in their own right with their own specific codes, characters, conventions and stories. Escape attempts are a key component and prison escape movies are almost numerous enough to constitute a specific sub-genre, but one that it's difficult to see A Man Escaped (Un condamné à mort s'est échappé / One Condemned to Die Escapes, alternatively titled Le vent souffle où il veut / The Wind Bloweth Where It Listeth) as part of, despite the main thrust of its story and the familiarity of a small sprinkling of its elements. It's a film true to its title in every respect, focusing almost exclusively on the central character of Fontaine and his quest to free himself from the cell in which he is being held. Unlike many of his sub-genre counterparts, he is not driven just by an urge for freedom but the knowledge that his life depends upon his success. This is 1943 Lyon under Nazi occupation and Fontaine has been arrested for Resistance activities and has no illusions about the punishment that will be meted out. Based on the true-life memoirs of André Devigny, which according to the opening quote from director Robert Bresson have been cinematically realised "without embellishment," this is a story that offers a number of challenges for any film adaptation. Fontaine spends much of his time alone in his cell, and when briefly in the company of other prisoners is forbidden to communicate with them. He does, of course, but only in brief whispered exchanges, with more detailed information passed on via secretly written notes. This puts a stranglehold on traditional dialogue-driven plot development, which unfolds instead through Fontaine's voice-over (taken, we presume, directly from the source memoirs), François Leterrier's central performance and Bresson's skill as a visual storyteller. And what a skill it is, established compellingly in an opening shot that effectively sets up Fontaine's situation and intentions in three small camera moves as he rides in the back seat of a car to prison. That the title telegraphs the ending is unimportant – after all, knowing in advance that Woodward and Bernstein succeeded in uncovering the Watergate scandal in no way made All the President's Men any less tense or compelling. It's the process and particularly the detail that make A Man Escaped such consistently gripping cinema. Like the planning and robbery in Jules Dassin's masterful Rififi of the previous year, Fontaine's meticulous efforts are observed in sometimes nerve-wracking silence and never for a second strain credibility within the context of the time and setting. 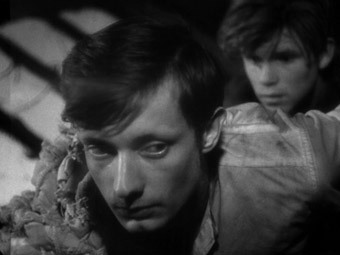 Bresson's approach assures total identification with Fontaine and his quest, making us cell-mates with a man we must trust rather than converse with, our involvement deep enough to inwardly cheer his small successes and genuinely fear the consequences of setbacks. I have not read the memoirs on which the film was based and have no reason to doubt Bresson's opening statement, but the timing perfection of varying twists of fate seem almost tailor-made for film drama and does suggest a stripping down of the original story to its narrative essentials, but one that makes for great cinematic storytelling. A Man Escaped is often tagged with a minimalist label for its single character focus, its use of silence and its rationed dialogue, but such a categorisation fails to acknowledge the density of incident and brisk pace at which the drama unfolds. Bresson may linger on specific details, but he always does so with purpose, and there's not a shot in the entire film that feels any way superfluous or decorative. 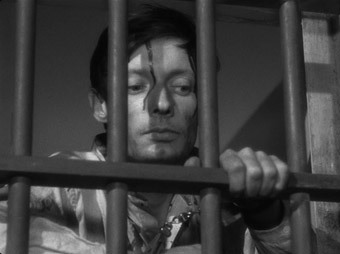 The tension is seriously cranked up in the final act as Fontaine's plans encounter an unexpected complication and a time limit is placed on his intentions, and Bresson demonstrates just how to stage a convincing but still nail-biting escape attempt, one that emphasises the caution and patience that such an operation requires. A Man Escaped is like a pristine product of the steam age, a machine that can be admired as much for its engineering as for how well it executes the task for which it was constructed. There are editing decisions here – specifically the decision to hold on specific shots for far longer than expected in order to communicate the tension of having to wait for the right moment to take action – that were seriously ahead of their time in 1956 and still look innovative today, and in both cinematic and dramatic terms the films has aged handsomely. For many reasons it's a film to be admired, but crucially it's one to also be enthralled and ultimately moved by. Léonce-Henri Burel's superb monochrome lighting camerawork is given the transfer it deserves (Burel, a veteran cinematographer by the time he worked with Bresson, also photographed Abel Gance's magnificent 1927 Napoléon), a crisp picture with excellent contrast, shadow detail and black levels. There is some flickering in places, but it rarely lasts long and is not distracting. The mono 2.0 soundtrack is clear with no intrusive crackle and only a trace of hiss. Given the extensive use and importance of silence in the film, this is something to be especially grateful for. A documentary on the director made in 1984 by two young aspiring Dutch filmmakers Jurriën Rood and Leo de Boer, this is a detailed and scholarly introduction to the director's oeuvre and distinctive style. It includes interviews with filmmakers Andrei Tarkovsky, Louis Malle and Paul Schrader and actress Dominique Sanda, and is broken into chapters that deal with various aspects of Bresson's cinema. An intriguing thread features Rood and de Boer attempting to track down the camera-shy Bresson for an interview which, when granted, is short but worth the wait. Extracts from some of Bressons's films are included, including a plot-spoiling sequence from The Devil, Probably. There's also a Bresson Filmography. A low key but genuinely superb film that should offer the uninitiated the perfect road in to the cinema of Robert Bresson. Those who already know the film should be pleased with the transfer and the fine extra feature.